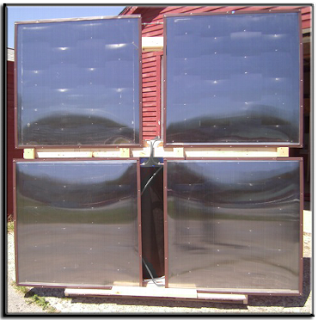 Tom Gocze from AmericanSolarTechnics has come out with a kit for a solar domestic water heating system that is designed from the ground up for DIYers. The kit uses four small collectors, each of which is 4 by 4 ft and weighs only about 20 lbs. The collectors hook up in series for easier plumbing connections. The light weight, manageable size, and easier plumbing connections make for an easier DIY installation. The collector absorbers are copper tubes with aluminium fins, and the collectors are glazed with twinwall polycarbonate. The storage tank is the SofTank, which AmericanSolarTechnics has been selling for some time. The tank capacity is about 200 gallons. I have one of these tanks and I like it. It is a unique design that uses an outer fabric sleeve to bear the water pressure loads. 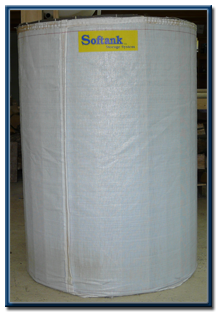 Inside the sleeve are several layers of polyiso foam board insulation, and inside the insulation is a high temperature liner that contains the hot water. Copper pipe coil heat exchangers transfer heat to the tank from the collectors, and heat your domestic water using heat stored in the tank. Your current hot water heater acts as the backup heater when solar is not available. Tom has felt for a long time that solar water heating systems are too expensive -- something I strongly agree with. This kit is his effort to bring the price down to a reasonable level that offers a good payback. The kit is $2750 -- this compares with typical commercial systems costing around $8000. While the system is not yet SRCC certified, this is in the plans.